Modeled after LCV Victory Fund’s federal “Dirty Dozen,” the “Dirty Dozen in the States” contains some of the worst offenders in the nation when it comes to undermining protections for clean water, carbon emissions, public health, and more. Members of the "Dirty Dozen in the States" have consistently sided against the environment and—regardless of party affiliation—are running in races in which an LCV state affiliate has a serious chance to affect the outcome. ​In the last election cycles, CTLCV has named two legislators to the Dirty Dozen. Len Suzio - Defeated in 2018! State Senator Len Suzio (R-13) actively undermined children's health in the 2017 and 2018 legislative sessions, lobbying hard against bans to toxic tire mulch in school playgrounds and carcinogenic flame retardants in children’s clothes. CTLCV opposed Suzio's campaign and endorsed his challenger, Mary Abrams. Abrams proved successful in the 2018 elections, and CTLCV celebrated her victory. 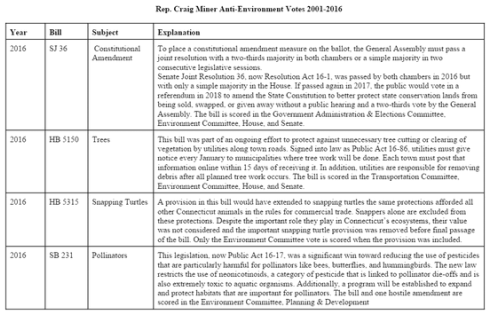 From 2001 to 2018, Craig Miner has taken the anti-environmental position on more than 85 important environmental bills in the Connecticut legislature. The bills have been compiled into the following table. To view the table, please click here or on the image below. To view the Dirty Dozen press release, please click here.